Its dailies in Germany's Rhine-Main area include the Allgemeine Zeitung, the Wiesbadener Kurier and the Darmstädter Echo, while the Wetzlarer Neue Zeitung and the Gießener Anzeiger are among their publications in the middle Hessian newspaper market. In addition to this, the VRM reaches almost two million unique users across the company and reaches out to roughly half a million social media users. A wide range of target market media, advertisers and magazines plus numerous initiatives and involvements complete VRM's product portfolio. All in all, the company has one of the widest-reaching networks of all regional media houses in Germany. 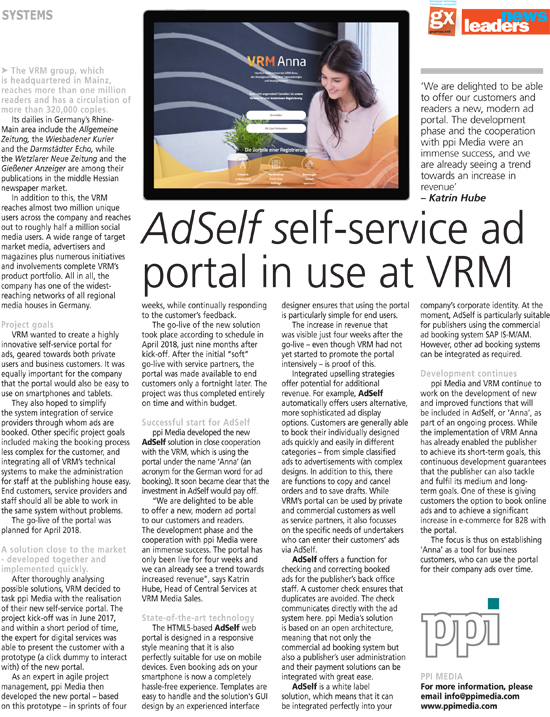 VRM wanted to create a highly innovative self-service portal for ads, geared towards both private users and business customers. It was equally important for the company that the portal would also be easy to use on smartphones and tablets. They also hoped to simplify the system integration of service providers through whom ads are booked. Other specific project goals included making the booking process less complex for the customer, and integrating all of VRM's technical systems to make the administration for staff at the publishing house easy. End customers, service providers and staff should all be able to work in the same system without problems. The go-live of the portal was planned for April 2018. After thoroughly analysing possible solutions, VRM decided to task ppi Media with the realisation of their new self-service portal. The project kick-off was in June 2017, and within a short period of time, the expert for digital services was able to present the customer with a prototype (a click dummy to interact with) of the new portal. As an expert in agile project management, ppi Media then developed the new portal - based on this prototype - in sprints of four weeks, while continually responding to the customer's feedback. The go-live of the new solution took place according to schedule in April 2018, just nine months after kick-off. After the initial "soft" go-live with service partners, the portal was made available to end customers only a fortnight later. The project was thus completed entirely on time and within budget. ppi Media developed the new AdSelf solution in close cooperation with the VRM, which is using the portal under the name 'Anna' (an acronym for the German word for ad booking). It soon became clear that the investment in AdSelf would pay off. "We are delighted to be able to offer a new, modern ad portal to our customers and readers. The development phase and the cooperation with ppi Media were an immense success. The portal has only been live for four weeks and we can already see a trend towards increased revenue", says Katrin Hube, Head of Central Services at VRM Media Sales. The HTML5-based AdSelf web portal is designed in a responsive style meaning that it is also perfectly suitable for use on mobile devices. Even booking ads on your smartphone is now a completely hassle-free experience. Templates are easy to handle and the solution's GUI design by an experienced interface designer ensures that using the portal is particularly simple for end users. The increase in revenue that was visible just four weeks after the go-live - even though VRM had not yet started to promote the portal intensively - is proof of this. Integrated upselling strategies offer potential for additional revenue. For example, AdSelf automatically offers users alternative, more sophisticated ad display options. Customers are generally able to book their individually designed ads quickly and easily in different categories - from simple classified ads to advertisements with complex designs. In addition to this, there are functions to copy and cancel orders and to save drafts. While VRM's portal can be used by private and commercial customers as well as service partners, it also focusses on the specific needs of undertakers who can enter their customers' ads via AdSelf. AdSelf offers a function for checking and correcting booked ads for the publisher's back office staff. A customer check ensures that duplicates are avoided. The check communicates directly with the ad system here. ppi Media's solution is based on an open architecture, meaning that not only the commercial ad booking system but also a publisher's user administration and their payment solutions can be integrated with great ease. AdSelf is a white label solution, which means that it can be integrated perfectly into your company's corporate identity. At the moment, AdSelf is particularly suitable for publishers using the commercial ad booking system SAP IS-M/AM. However, other ad booking systems can be integrated as required. ppi Media and VRM continue to work on the development of new and improved functions that will be included in AdSelf, or 'Anna', as part of an ongoing process. While the implementation of VRM Anna has already enabled the publisher to achieve its short-term goals, this continuous development guarantees that the publisher can also tackle and fulfil its medium and long-term goals. One of these is giving customers the option to book online ads and to achieve a significant increase in e-commerce for B2B with the portal. The focus is thus on establishing 'Anna' as a tool for business customers, who can use the portal for their company ads over time.